Bubbles when you ferment, they’re symbolic for how I feel: Ferments are exciting to make! This chunky condiment is not only one to make for your holiday tables, but also one to eat from the moment cranberries appear to the moment they disappear from the markets. 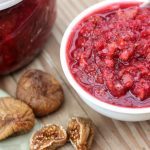 Fermented Cranberry Sauce with maple, figs, citrus and cloves is great on sandwiches, with all meats, including salmon, with salads! It’s Paleo and has no refined sugar. I hope you’re feeling exuberant and enthusiastic about grabbing cranberries and these other ingredients and getting started on this very fun and easy ferment! 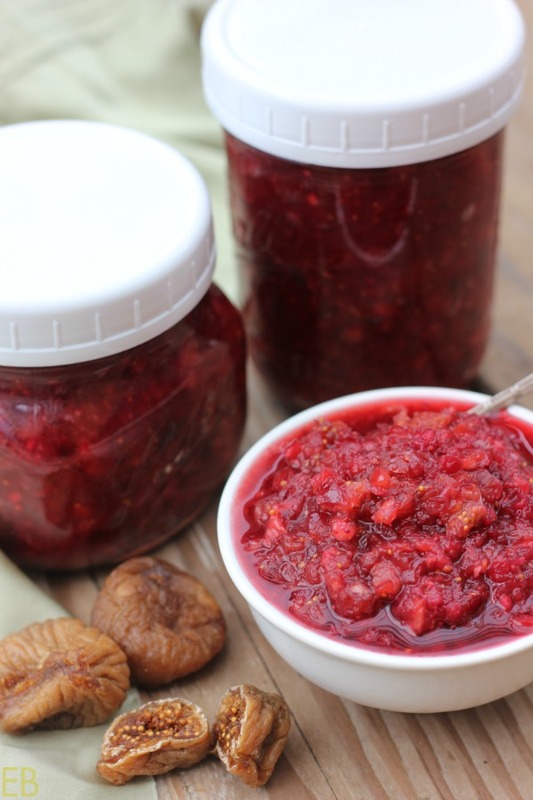 This is one special probiotic cranberry sauce recipe. The odd thing about cranberries is that they lose their zing when they’re fermented. The zing (their tartness) is their nutrition, and it mellows yet amplifies, becoming more potent and digestible. Flavor-wise we need to make cranberry ferments as exciting as the flavor of raw or cooked cranberries; because fermented berries are more nutritious! Cranberries are super high in vitamin C, anti-flammatory in nature and high in antioxidants. So, I’ve added the best of all fruits to this ferment: the fig, the dried fig. The flavor and texture combo is lovely and complimentary. This recipe also includes raisins for sweetness, citrus for zing, maple for depth and sweetness, sea salt for umami and to bless the fermentation process, and a couple of fitting spices like cinnamon and cloves. Taste the serious, intense, complex goodness — earthy, tangy, sweet. Whether you’ve fermented before or are new to it, the one challenge most have with the process is keeping the recipe anaerobic, which just means without air. When this or any veggie/fruit kraut is packed into jars or a fermentation crock it must be weighted down so the solids stay beneath the brine, thus preventing mold and allowing their preservation. Place cranberries into high powered blender or food processor. Pulse repeatedly until cranberries are diced and minced. Empty cranberries into medium-size fermentation crock or ceramic/glass large bowl. Set aside. Add remaining ingredients to blender, except the brine and cinnamon stick, (if using). Pulse until ingredients are chopped small, without pureeing. Add blender contents to crock or large bowl with cranberries. Using a wooden spoon, stir in brine. Spoon sauce into sterilized jars, if not using ferment crock. Weight down, so brine rises just slightly above weight. Clean the rim and inside upper edge of jar or crock. Place lid on jar or crock. Leave at room temperature, preferably in a warm location or on a warm sprouting mat (if winter time- see Recipe notes for mat) for about 5 days. Ferment may be bubbly when complete. Refrigerate or place in cold storage. Serve over time, enjoying up to 1/4 cup with meals. A sprouting mat (find it HERE) is great for fermentation of all kinds during the colder months. It will keep your cranberry sauce warm and move the fermentation safely forward, even when the house gets cool overnight. Other sides for your holiday table? Try THIS fantastic Grain-free Stuffing with Sausage. We make it every year, and even those with a standard American diet come back for seconds. HERE’s our favorite Winter Squash OR Sweet Potato Casserole, (which can be made ahead and frozen before baking). THIS is our Holiday Salad with Caramelized Delicata Squash, Sage & Raspberries, so pretty and delicious. Oh my goodness, the flavors in this! All the maple and fig with tart cranberries and citrus, plus deep spicy notes….HEAVEN! Megan this is such a lovely idea! I love those figs in there, I would never have thought to add them, so brilliant! This is such a perfect side for the holidays. YUM! Thank you, Emily!! I love when flavors come together like this!! Cooking can be poetry! And figs are always such a muse and offer beautiful supportive character. xo! Oh wow, love the addition of figs! Figs! What a great idea. I bet your TG is amazing! LOL, it took me several moments to figure out TG! 😉 Thank you, yes. xo! Oh but those figs! and I love the briney ferment addition! Lovely! The color is lovely Megan! I never thought to add figs before, what a wonderful idea! Yum! I love fermented anything and this is such a great way to elevate a Thanksgiving classic. Looks delicious! I love your word “elevate.” Thank you for your sweet comment. 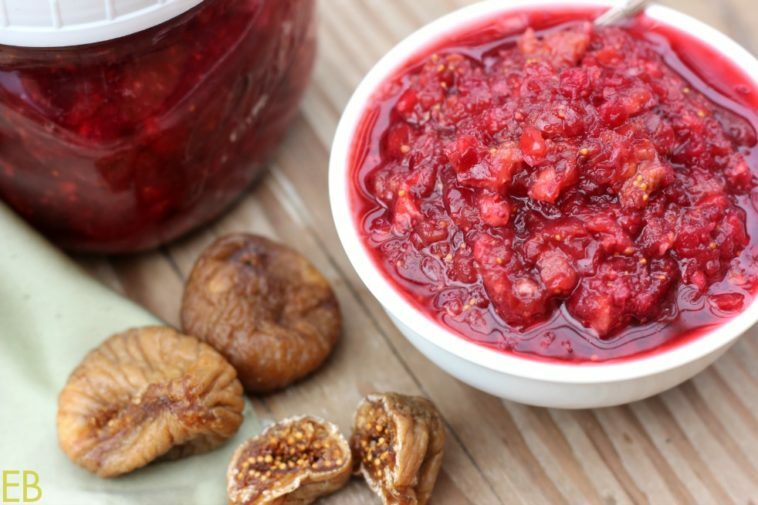 Mmmm I love homemade cranberry sauce and I’m really loving that you incorporated figs! What a fun twist on a classic! Thanks, Christina. It’s so sweet to be able to access figs year round by buying them dried. I love them so much!! I love fermented foods, but I’ve never actually done it myself before. It’s interesting to know that you need to weigh it down into the liquid. It makes perfect sense, but something I never thought of before. I know, right? The anaerobic aspect has always been the biggest challenge; and I’m so grateful for the various fermenting tools that have been developed in the last 5 years to help with this aspect. This is such a unique recipe! I’m so interested in the ingredients and how it would all taste together. Thanks, Vanessa. I hope you get to make it. It’s such a rewarding recipe with exciting ingredients to make a meal special. I am curious, since I am new to fermenting, can you use a culture starter vs a brine? This is great, Megan! I am fermenting cranberries too this year, so thank you for this lovely flavour combination – I will definitely have to try! I don’t use whey or sauerkraut juice though, as there is enough natural culture in my ingredients to get the process started, especially if I use raw honey instead of maple syrup. I guess the extra starter helps if we use maple syrup which is cooked. Thanks for the recipe! Your process and recipe sound exciting Yang!! Love the addition of figs! I would have never thought to ferment cranberries, but I imagine it gives them a great flavor! Yes, for sure, and their color is soo pretty! I need this sauce on my holiday table! Thanks for all the love you put in your recipes. Thanks! Hi Megan, is there a way to know when the ferment is “done?” Mine has been in the kimchi fermenter for 5 days, but in a cooler house (no fermenting mat). I’m just wondering if I should leave it in for a longer period? Is there a ” too long” time period?